ACAPULCO, Mexico - Police found the bodies of 15 slain men, 14 of them headless, on a street outside a shopping center in the Pacific coast resort of Acapulco on Saturday. Police in the southern state of Guerrero, where Acapulco is located, said handwritten signs were left with the bodies, a common calling card of Mexico's cartels. Acapulco has seen bloody turf battles between drug gangs in recent years. The bodies were found in an area not frequented by tourists. The victims all appeared to be in their 20s. It was the largest single group of decapitation victims in recent years. In 2008, a group of 12 decapitated bodies were piled outside the Yucatan state capital of Merida. The same year, 9 headless men were found in the Guerrero state capital of Chilpancingo. In keeping with a policy designed not to give the cartels publicity, state police did not release the text of the messages found with the bodies. But Reforma newspaper reported that they referred to the Sinaloa cartel, headed by drug lord Joaquin "El Chapo" Guzman. Reforma said they apparently indicated the victims were killed by the Sinaloa cartel for trying to intrude on the gang's turf and extort residents. At least 30,196 people have died in drug-related violence since President Felipe Calderon launched an offensive against cartels in late 2006. Also Saturday, authorities said a small-town mayor was found dead in northern Mexico. Saul Vara Rivera, mayor of the municipality of Zaragoza, was reported missing by family members Wednesday, Coahuila state prosecutors said in a statement. 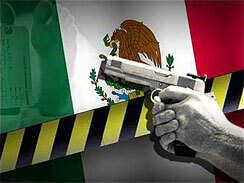 His bullet-ridden body was discovered Friday in neighboring Nuevo Leon state. At least a dozen mayors were killed nationwide last year in acts of intimidation attributed to drug gangs.